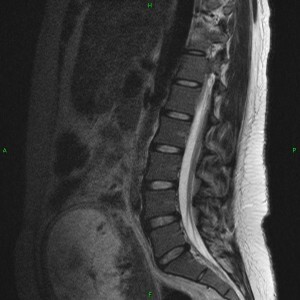 Click Here for Access to Your "Patient Portal"
In young healthy individuals, there is a straight alignment from one lumbar vertebra to another, the edges of each vertebra are uniform and regular in appearance, the disc spaces are well maintained (not flattened), the disc walls are straight (not bulging), and the color of the discs on MRI imaging is white, signifying a healthy level of water hydration within the discs. With aging, and as physical loads are applied to the spine, the alignment of the spine shifts, the discs lose their hydration (now appearing dark on MRI), and the disc walls begin to bulge or herniate – typically along the posterior disc wall margins (from repeated forward flexion at the waist). 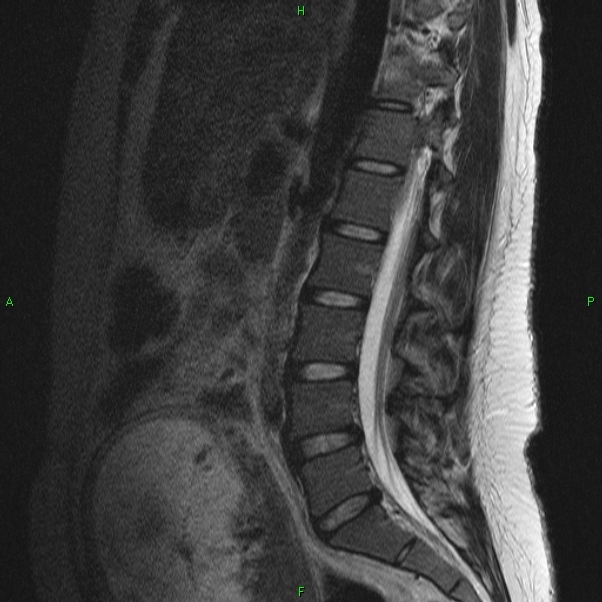 The pictures shown below highlight some of the typical MRI appearances associated with this progression. 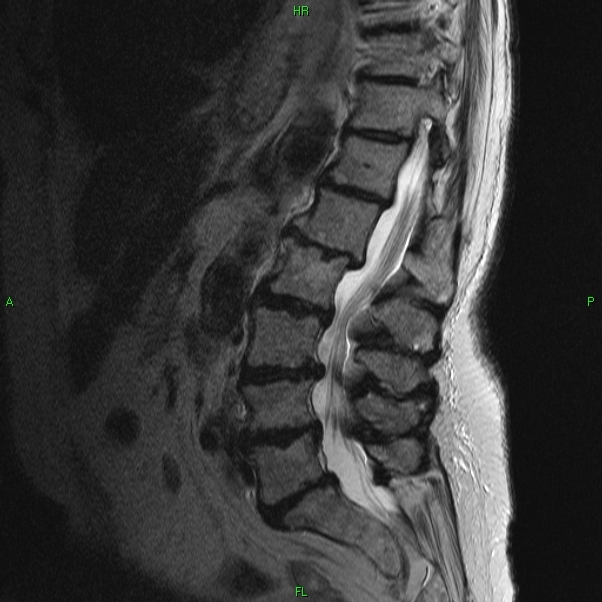 The vertebrae are the square shaped gray structures stacked in a column, the discs are the small band shaped structures between each vertebrae, the while vertical tube to the right of the spine is the spinal column where nerves travel, and the spinal cord is the grayish vertical stranded structures traveling within the canal. As you can see, spine deterioration can cause crowding of the spinal cord (nerves) within the bony spinal column. 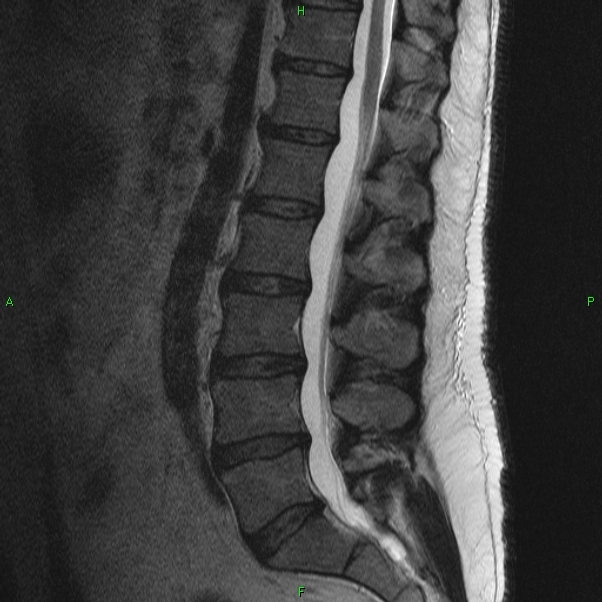 These are views of the lower back seen from the side or lateral viewpoint. The simplest lower back surgery is simply to remove the bulging part of the disc, “discectomy” or fragments of bone, “laminectomy” which are in themselves painful, and to remove any impingement or crowding that these structures might be imposing on traversing nerves. This procedure usually is successful in reducing lower leg “sciatica” pains, but often does not solve lower back pain. In some cases, lower back pains are slightly worse. Over time, the body’s natural response to disc degeneration, and related bone-on-bone rubbing is bone spur formation, which ultimately unite to fuse the painful disc spaces together. Surgeons can hasten this process through a surgical lumbar fusion. Fusion methods include Posterior Lumbar Inter-Body Fusion (PLIF), which involves the placement of rigid stabilizing lag screws into the spine, linked by inter-locking rods. A wide area of the dorsal arch of bone, or lamina, is also removed to reduce constricting pressures on the nerves within. And bone graft material is layered across the gaps removed by earlier, which in time will fuse together to strength the bonds between bones. BAK Cage implants can also be positioned between the vertebrae, which serves to rigidly separate the individual bones of the spine and to ensure proper gapping between the bones for safe passage of transiting nerve structures. Small holes are drilled into the bony vertebrae and then the implants are inserted, and screwed into place. Anterior cervical fusion involves an incision to the anterior neck, and through this portal,surgeons are able to enter the spine and disc spaces. Disc fragments can be removed, and an anterior metallic plate with screw fixation is applied, to widen and stabilize the gap between bones which had been affected by the disc collapse. 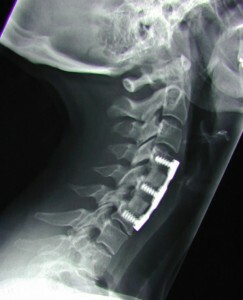 Sometimes bone graft material is inserted between the vertebrae, replacing in a sense the degenerated disc. In 4-6 months, the graft material matures, fusing the adjacent vertebrae, and eliminating the painful degenerated disc space that had existed earlier. The simplest lower back surgery is simply to remove the bulging part of the disc, “discectomy” or fragments of bone, “laminectomy” which are in themselves painful, and to remove any impingement or crowding that these structures might be imposing on traversing nerves. Anterior cervical fusion involves an incision to the anterior neck, and through this portal,surgeons are able to enter the spine and disc spaces. 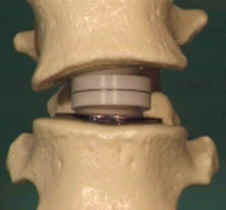 Disc fragments can be removed, and an anterior metallic plate with screw fixation is applied, to widen and stabilize the gap between bones which had been affected by the disc collapse. 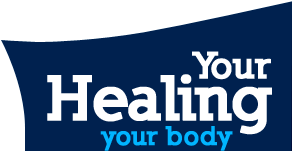 Copyright © 2010 Cuyahoga Valley Spine & Arthritis Center LLC All Rights Reserved.